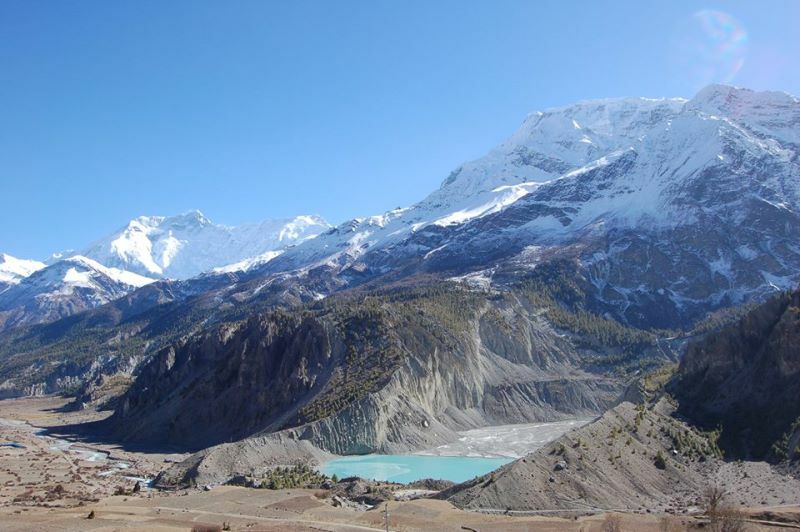 Annapurna Circuit Trek is one of the best and rewarding treks in Nepal. 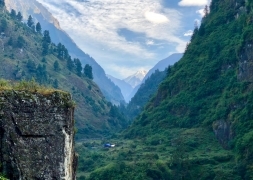 It offers a unique insight into the natural and cultural diversity of Nepal. 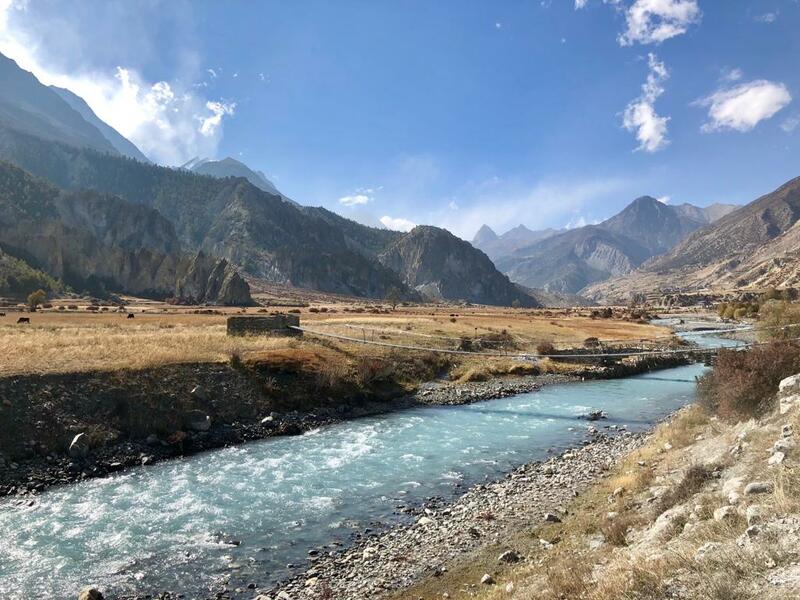 Hiking in this area is the great chance to explore the rare combination of long array of snow capped peaks, crystal clear lakes, turbulent rivers with deep gorges, hot springs and picturesque villages inhabited by simple and friendly local people. For doing this trek you should be sportive and need a good condition because you walk about 6 to 7 hours everyday. The panorama during this trek with over 6000 meter high mountain tops is breath taking. 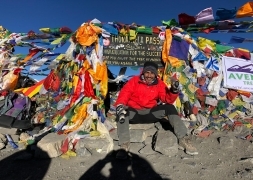 The most difficult challenge will be the ascent to Thorong La with a height of 5416m. During the trek you will stay in simple but homely lodges during the nights. 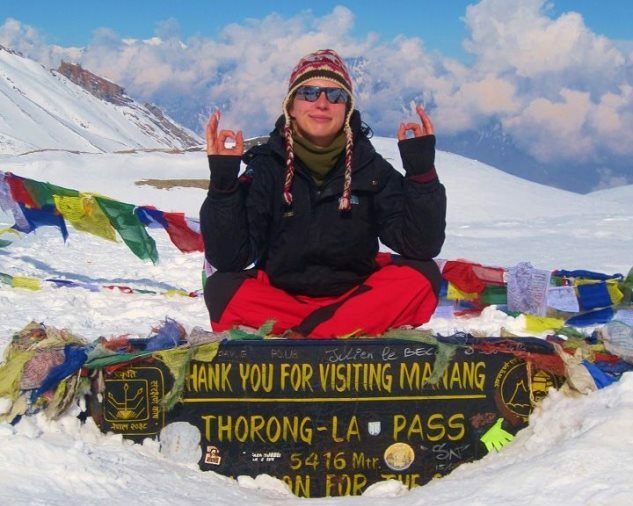 The Annapurna Circuit Trek is a great challenge if you want to make a real trekking. Day 08: Trek from Pisang to Manang (3500m) via Gyaru (3670m). Arrival at Tribhuvan International Airport in Kathmandu, and drive to one of the most beautiful and famous places of the Kathmandu valley: Nagarkot. There are various places around the edge of the Kathmandu Valley, which offer great mountain views, but the resort village of Nagarkot is generally regarded to be the best mountain view points there. Nagarkot is a popular tourist resort of Nepal situated about 32 kilometer east of Kathmandu and with an altitude of 2175m above sea level. The panorama of the major peaks of eastern Nepal Himalayas including Mt. Everest (8848m), Manaslu (8463m), Ganesh Himal (7111m) and Langtang (7246m) is visible from there. After having breakfast you will go for sightseeing in Bhaktapur which is located in the east corner of the Kathmandu Valley. It is an ancient Newar city abought 8 miles far from the capital city Kathmandu. Bhaktapur was the largest of the three Newa kingdoms of the Kathmandu Valley, and was the capital of Nepal during the great "Malla" Kingdom until the second half of the 15th century. It is famous for its rich culture, temples, and wood, metal and stone artworks and is listed as a World Heritage Site by UNESCO. Ride through rice terraces and sub-tropical vegetation into the Trisuli valley and from there across Besisahar to Bulbule. The drive will take 6 to 7 hours. Over Dharapani (1960m), we carry on up the west bank taking the path to Bagarchap (2105m). Here the Tibetan style flat roofs are a clear indication of the reduction in rainfall to the area as we enter the rain shadow of the Annapurna range. Past excellent views of the east face of Lamjung Himal; we get to Timang (2355m) for lunch, and then take the easy path to the district administrative centre of Chame, our lodge for the night. Walk to 5-6 hours. We follow up the narrow forested valley to the old Khampa settlement at Bhradang (2845m), our lunch stop, once a centre for these fierce Tibetan warriors’s resistance to Chinese occupation. We cross over and begin to climb up through the forest away from the river. The silence itself is dramatic as we round this pine forested ridge. We continue down to Pisang, our night stop. The Tibetan feel of the village is unmistakable, fine tapering walled houses and long lines of prayer wheels and mane walls. There is an excellent short detour for those with some spare energy, up to Pisang Gompa (3230m) across on the north bank, with amazing views back of the huge north face of Annapurna II. Hike to 5-6 Hrs. 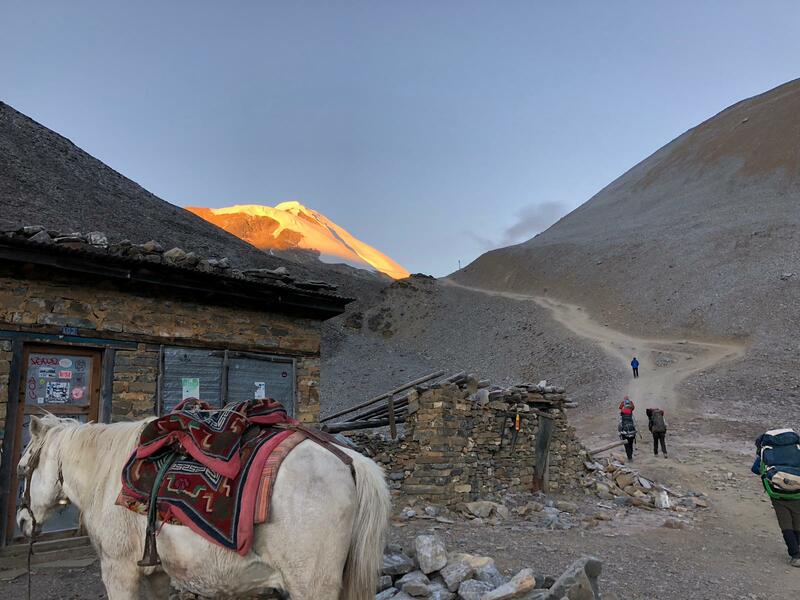 There is a choice of two routes: a shorter direct one along the south bank valley floor via Hongde airstrip, or a more interesting, but longer route higher on the north bank through the villages of Gharyu (3670m) and Ngawal (3657m). A visit to Barge monastery, the largest in the entire district of Manang will be memorable. Braga (3360m) cliff side village, below its 900 year old gompa (monastery) of the Kargyupa sector of Buddhism, sadly now little used. Walk to 6-7 Hrs. Manang is a fascinating village, the chief Buddhist village that gives its name to the area. As such it’s ideal for our essential acclimatization rest day before taking on the Thorong La. There are excellent side trips such as the short climb to the Cliffside Bod-zo Gompa where the lama performs a blessing ceremony to protect us on our journey. Bhojo Gompa or Gangapurna Lake is worth visiting sites from acclimatization point of view. An easy excursion to a little distance away to a village called Vraga, a small old village with a monastery is also possible.The more energetic may wish to visit the high village of Khangsar on the opposite bank. A good day's round trip and well worth the effort. This is quite a short day as its essential to set up proper acclimatization on the approach to the pass and limit the height gain between our night stops. Up to Tengi (3640m) the last permanent settlement before the pass, we get stunning views across to Tilicho and the Great Barrier on this alternative high altitude traverse over to the Kali Gandaki. Passing through Gunsang (3900m), above here there are only Goth (shepherd's shelters), Karkha (summer pastures) and our seasonal lodges. We reach our night stop at Yak Kharka (4200m) where there are the best lodges in the area. 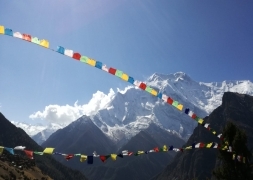 In the afternoon we can explore fantastic views of Annapurna ranges and Chulu West (6419m) as well as pasture areas and yak kingdom. 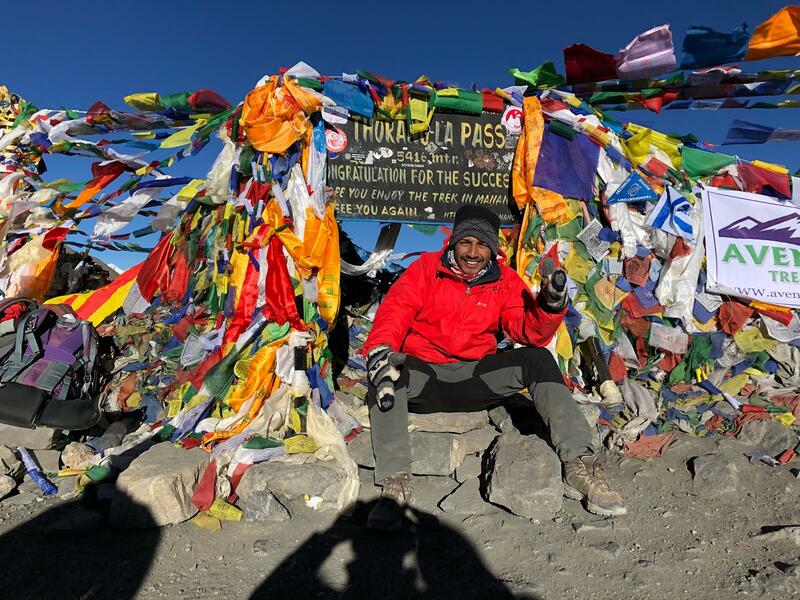 Walking 5-6 hrs..
After leaving Thorong Phedi, on the way to Muktinath we have to cross Thorong La Pass (5416m), between beautiful mountain ranges -Kathung Khang (6484m), Yakawakhang (6482m), from where we can see mountains like Dhaulagiri (8167m), Nilgir north (7061m), Tukuche Peak (6920m) and Dhampus Peak (6012m) and we can also see Jomsom Village from here. After Thorong La Pass, we start descending down the barren Kali Gandaki Valley, which is far below to the west. Eventually the moraines yields to grassy slopes and the final descent walk to Muktinath is a pleasant walk along the upper part of the Jhong Valley. We cross the meadows, drop into a deep ravine the starting of the Jhong Khola, climb out and follow a wide trail into Muktinath. Muktinath Temple is the incarnation of Lord Vishnu. Behind the temple, there are 108 waterspouts, which are ever known as Mukti Dhara. People believed that by taking bath in this waterspout god absolve the sins of the people, that's why many people visit there for worshipping Lord Vishnu. Morning visit to famous Hindu and Buddhist religious site, Muktinath Temple and descent to Kagbeni (2800m) through the villages Jharkot (3550m) and Khingar (3280m). Kagbeni is the entrance gate of Upper Mustang and has a very old monastery. We explore the Kagbeni Village, the lifestyle of people is Tibetan and they also follow Tibetan culture. We can also visit the Monastery. Then we trek to Jomsom, which is the administrative centre of this region. 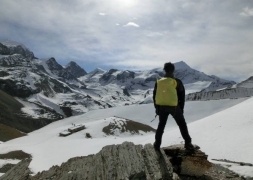 From Jomsom we can see the fascinating view of Tilocho Peak (7134m) and Nilgiri Himal. Here is an existence of airport, government offices and Army Camp. This scenic flight from Jomsom takes about 25 minutes to Pokhara. Then we have the full day to explore Pokhara city, one of the most popular destination for visitors in Nepal. The natural beauty of its lakeside location and its proximity to the mountains has made in the natural choice for trekkers and adventures. Here you will have a sightseeing tour at Barahi Temple, Davi's fall and Mahendra Cave. Today we drive back to Kathmandu. After reaching Kathmandu, you can spend the day as you like. You can shop for souvenirs, explore the old bazaars, or just relax and chill out. If you want you can also go with your guide to Kathmandu Durbar Square and after that visit the touristic area of Kathmandu, Thamel with its numerous shops and restaurants. Then you will go to the big stupa of Boudhanath, which is also known as little Tibet and enjoy your dinner at the rooftop of the hotel with view of the Stupa. Enjoy the frequent changing sceneries day by day. In the beginning of trekking days you walk through low lying green hills and then come to drier, arid landscape. The highest place of Annapurna round trekking is Thorong La pass at an altitude of 5416m. 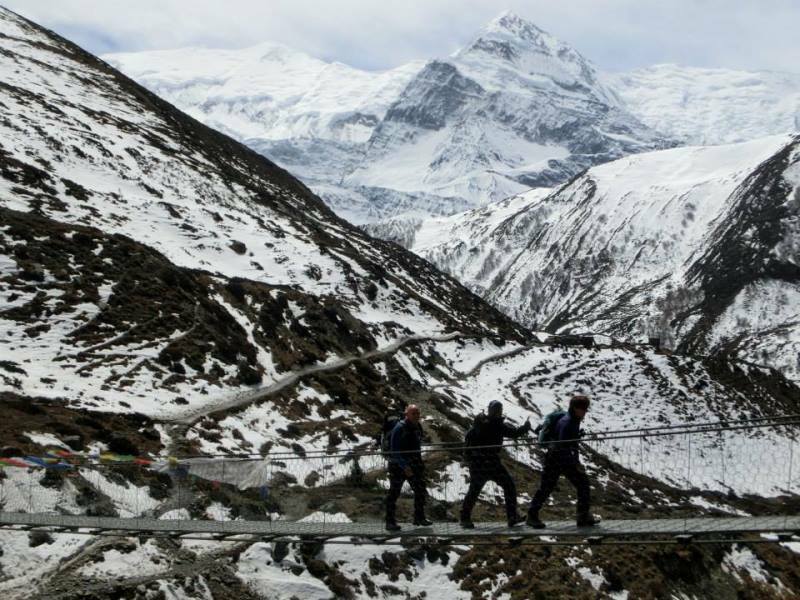 Crossing this high pass is the dream of any trekker. Later you will walk and experience the warm hospitality of local people and their culture.